This summer a man will face his destiny. A hero will be revealed. In Spider-Man 2, the latest installment in the blockbuster Spider-Man series, based on the classic Marvel Comics hero, Tobey Maguire returns as the mild-mannered Peter Parker, who is juggling the delicate balance of his dual life as college student and a superhuman crime fighter. Peter's life becomes even more complicated when he confronts a new nemesis, the brilliant Otto Octavius (Alfred Molina) who has been reincarnated as the maniacal and multi-tentacled "Doc Ock." When Doc Ock kidnaps MJ (Kirsten Dunst), Spider-Man must swing back into action as the adventure reaches new heights of unprecedented excitement. $115.817 million on 4152 screens. For me, 2002’s smash hit Spider-Man provided a nearly-perfect comic book movie. Would its 2004 sequel prove as effective? Not quite, but it fared pretty darned well on its own. Set about two years after the first movie, Peter Parker (Tobey Maguire) finds it hard to balance his “normal” life and his web-swinging ways as Spider-Man. He always runs late at his pizza delivery job, and that gets him fired. Peter usually earns money with the photos of Spidey he sells to the Daily Bugle. Since editor J. Jonah Jameson (JK Simmons) uses these to turn the city against Spidey, Peter doesn’t want to give him more Spidey photos, but his wallet forces him to do so. In addition to Peter’s two jobs, he tries to maintain life as a college student. He botches this as well, for he consistently misses classes and suffers from rapidly dropping grades. Peter also lacks much of a social life, and we’re reminded of this when he comes to a surprise birthday party thrown by his Aunt May (Rosemary Harris) and attended by pals Mary Jane Watson (Kirsten Dunst) and Harry Osborn (James Franco). This encounter helps Peter in one way. Harry’s business works with scientist Dr. Otto Octavius (Alfred Molina), the subject of a paper Peter must write. Harry offers to introduce the two. A minor wedge remains between the friends, however, since Harry blames Spidey for his dad’s death, and he thinks Peter and the hero are buddies. This doesn’t stop Harry from encouraging Peter to go after longtime crush MJ, who also pines for Parker. Our hero forsook MJ romantically in the first movie to protect, and he continues to stand by that decision here. Peter doesn’t feel all that secure in his choice, though, especially when he learns that MJ has a new boyfriend. He promises to come see her new play, but other problems abound, such as his continued inability to pay his rent on time. Peter feels bothered by his aunt’s economic woes as well. Soon Harry introduces Peter to Otto, and we learn about his big project. The Doctor works on a “design to initiate and sustain fusion” which he describes as a “perpetual sun” to offer a terrific source of energy. Peter displays some concerns that woes may develop and cause a negative reaction, but he demonstrates faith in his scientific idol and potential mentor. A few factors lead Pete to a crossroads. Due to web-swinging duties, he misses MJ’s play, and that leads to her disappointment and irritation. In addition, Pete starts to lose control of his super abilities. For example, his web-shooters fail during one excursion. In the midst of this, Pete attends the demonstration of Octavius’s new power source. To operate it, the Doctor utilizes a super-intelligent four-armed mechanical device controlled with brain waves. The reaction starts well but soon deteriorates. Otto refuses to shut down the power since he believes it’ll stabilize, but it doesn’t. Matters worsen, and the effects lead to both the death of his wife Rosalie (Donna Murphy) and the fusion of the extra arms to Otto’s body. Doctors try to remove them, but a chip that inhibits their artificial intelligence breaks and the limbs act on their own to sustain their attachment to Octavius. The rest of the movie follows a few paths. We see “Doctor Octopus” - as christened by the folks at the Bugle - try to deal with his new abilities. He loathes the damage caused by the arms but he can’t resist them. They convince him to try to reclaim his research and prove his ideas to be correct. This sends him into supervillain territory, as he uses whatever means necessary to complete his research. In addition, Pete tries to cope with the negative pressures of being Spider-Man. His heroic role causes him little but grief, a fact that comes to a point as he photographs a reception attended by both Harry and MJ. She lets him know how much he disappointed her and also gets engaged to astronaut John Jameson (Daniel Gillies). Harry also tells off his pal due to a series of perceived transgressions. When Pete’s Spidey powers continue to falter, he throws in the towel and decides to give up his superheroic ways. The film follows his decision and its ramifications along with the actions of Doc Ock. But don’t take that as a slam, for I regarded Spider-Man as a nearly perfect comic book movie. The sequel mostly prospers but I think it suffers from a few more flaws. I also think that Spidey 2 borrows a little too liberally from the plot of Superman 2. In that flick, Supes attempts to give up his superlife to have a supergood time with superhot Lois, his dream woman. The concept behind Peter’s quitting the hero biz remains essentially the same, though as the film’s first act relentlessly belabors, many other factors contribute. As for all that belaboring, some may – and will – interpret those sequences as a flaw. While the first flick took a while to get to any Spider-action, it made sense that way; it needed to go through character set-ups and Spidey’s origins. With those bits firmly out of the way from last time, one may expect to hop right into battle in Spidey 2. That doesn’t happen. A couple of perfunctory action bits pop up in the first act, but they feel somewhat gratuitous. It’s as though the filmmakers don’t really want them but realize that a film with the name “Spider-Man” in the title should probably feature some shots of Spider-Man before it’s halfway finished. Whatever the case, Peter’s story heavily dominates the first act and beyond, which may frustrate some viewers. Not me, however, as I rather like the look at the reality of being a superhero. Spider-Man and Batman have always been my two favorite costumed crusaders, and both present many similarities, especially due to the origins of their decisions to fight crime. Batman seemed more motivated by revenge, whereas guilt prompted Peter Parker’s transformation. Nonetheless, violent deaths remained at the core of their choices. One major difference between the two relates to bankroll. The ultra-wealthy Bruce Wayne can finance all the gadgets he wants and doesn’t ever have to fret about real life. We get the feeling Bruce maintains a semblance of a normal life simply to make sure he covers up his secret identity, whereas Peter Parker enjoys none of those privileges. Spidey 2 revels in that fact, as the first act demonstrates all of the degradation that comes with his situation. Not only does Peter feel he can’t be with the woman he loves due to potential threats, but his incessant crime fighting makes him late for work, behind in his schoolwork, and absent from the lives of his friends and family. More so than any other flick of this sort I can recall, Spidey 2 lets us know the nuisance and chore elements of being a superhero. Indeed, director Sam Raimi truly delights in these moments; he clearly loves showing us that Spider-Man’s life isn’t a cakewalk. The film also isn’t afraid to let us see how much Peter enjoys his life when he’s free of his superheroic burden. Granted, he still feels occasional pangs of concern, but he lets those slip by pretty quickly as he realizes that you can’t save them all. In a telling move, only when matters become personal does Peter really reinvest himself into his heroic responsibilities. All of these moments of personal drama shouldn’t make you think this is Hamlet. Spider-Man 2 remains a comic book movie, and even with all of the soul-searching, it never forgets that. The film does take its characters and story seriously, but it still connects with a great sense of fun and adventure. Raimi’s quirky humor always shows through and makes sure that the comic book’s comedic bent pops up here as well. Peter Parker really should be a pathetic, sad character, but both comic and movie allow him to be amusingly pitiful. The film goes at its own pace, which I regard as a good thing. It doesn’t seem in a hurry to dazzle us with the action, though it still displays a terrific sense of wonder about things. For example, take the early scene in which Spidey uses a web to stop a police car from hitting a crowd. Segments like this show us just how amazing Spidey’s feats are, and many more of those moments come up throughout the flick. Spider-Man 2 remains a film with a heart. The characters give it its heft and soul, and the actors bring them to life well. I don’t think Doc Ock is as interesting as the first flick’s Green Goblin, but he’s also not quite as showy a character. Molina helps make him nicely three-dimensional. The other leads continue to do well. I still really like Maguire as Peter/Spidey. I’ve read the occasional complaint about him, but I honestly can’t imagine anyone better in the role. And I can’t imagine a better comic book movie series than Spider-Man. I love the first two Batman flicks and enjoy the early Superman films as well. The two X-Men pictures are good, too, and I’ve liked a few others. Except for maybe those Batman offerings, though, none of them compare with the two Spider-Man works. They’re terrific films and I can’t wait for the third one. 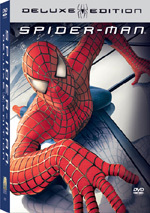 Spider-Man 2 appears in an aspect ratio of approximately 2.35:1 on this single-sided, double-layered DVD; the widescreen image has been enhanced for 16X9 televisions. A definite improvement over the special edition of the film, the Superbit Spider-Man 2 looked consistently positive. Sharpness usually worked well. Virtually no instances of softness occurred. Instead, the movie produced nicely crisp and detailed images. No issues with jagged edges or shimmering occurred, and I also detected no edge enhancement. One or two specks popped up, but otherwise the movie looked clean. Only a smidgen of grain became obvious during a few low-light interior shots. Probably the strongest aspect of the picture stemmed from its colors. As one might expect from a comic book movie, Spidey 2 used a bright and varied palette, though it emphasized primary colors. The tones seemed vibrant and dynamic. Blacks were deep and firm, while low-light shots appeared clear and smooth; no excessive opacity occurred. 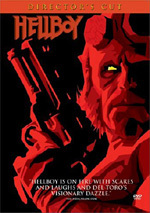 Many aspects of this Superbit DVD marked improvements over the two-disc special edition. Definition looked stronger, as I noticed none of the prior release’s minor softness or edge enhancement. The Superbit seemed smoother and didn’t show as much graininess. Colors and blacks remained terrific in both, though the hues were even more dazzling in the Superbit rendition. Often I see little difference between standard and Superbit DVDs, but this version of Spider-Man 2 really impressed me. As with almost all Superbit DVDs, Spider-Man 2 included both Dolby Digital 5.1 and DTS 5.1 soundtracks. Most of the time I think the pair sound identical, but in this case, I preferred the DTS mix. I’ll discuss the Dolby edition first, as it replicated the audio heard on the two-disc special edition, and then I’ll get into the ways I thought the DTS track bettered it. The Dolby mix presented an experience that closely resembled what I heard during the first Spider-Man movie, though it was less ambitious due to the movie’s focus. The soundfield created a broad and engaging piece. Because the movie was often quite chatty, I can’t say that the audio cranked from all five speakers on a constant basis. However, it offered a consistently good feel for its environment, and the action sequences made sure that it packed an impact. Those worked within the spectrum well and led us to sense the movement of the fights and other lively scenes well. Pieces zipped and zoomed around the room well, as the surrounds added a lot of useful audio to the package. Audio quality always remained positive. Speech sounded firm and crisp, with no edginess or issues connected to intelligibility. Music appeared bright and bold, with tight highs and warm lows. Effects also presented strong reproduction. Those elements were clean and concise, and the louder pieces offered strong bass. How did the DTS mix improve upon the Dolby one? It sounded slightly smoother and better integrated. I thought the soundfield presented a bit more activity and became more involving. In addition, audio quality was a little clearer and better delineated. Bass almost started to go out of control during the louder moments of the Dolby track, but they stayed tight here. The improvements weren’t tremendous, but the DTS mix seemed strong enough to knock it into “A-“ territory. I really like Spider-Man 2 and heartily recommend it. In fact, the more I see it, the more I enjoy it. I’ve watched it three times in half a year and think it grows more impressive with each viewing. The question becomes which DVD to get. Without question, the Superbit edition of Spider-Man 2 presents the best picture and audio; the visuals particularly improve over the special edition. However, the Superbit comes with absolutely no extras, whereas the two-disc set was absolutely packed with great stuff. Therein lies the buyer’s dilemma. I really liked the quality of the Superbit disc but as a fan, I’d not like to lose the terrific supplements from the special edition. Ultimately, I think the two-disc set will remain the most satisfying for the most people. After all, it’s not like it looked or sounded bad. However, for those with an interest in taking in the highest quality presentation of the movie, I’ll recommend the Superbit disc, as it clearly wins in both the audio and visual categories.